Bamboo coral belongs to the octocoral group and is only a distant relative of reef-forming “hard corals” or scleractinians. They are common today in deep seas because they do not need sunlight for photosynthetic symbionts like most hard corals do. 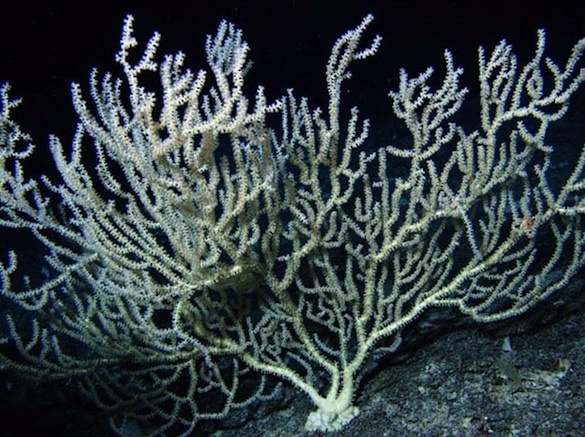 They have multiple polyps for feeding, none of which can retract back into the skeleton. That is why the surface of these internodes is so smooth and without the usual corallite holes. Above is a colony of white bamboo coral (Keratoisis flexibilis); image from Wikimedia Commons. 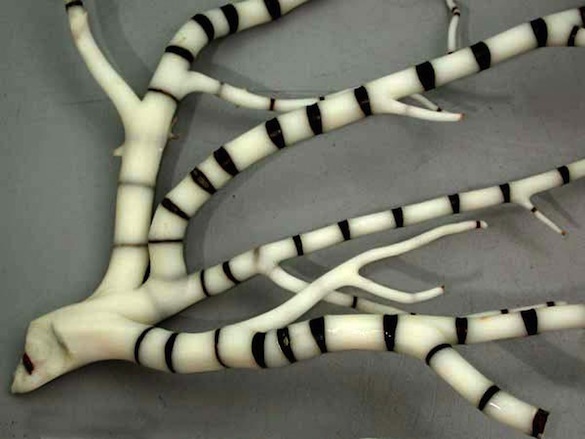 Bamboo corals are long-lived, and it has been recently discovered that they incorporate trace elements in their skeletons as they grow, making them excellent specimens for studying changes in the chemistry and circulation of deep-sea waters. These fossils may thus someday be useful for sorting out the complex changes in the Mediterranean during the Pleistocene. Sinclair, D.J., Williams, B., Allard, G., Ghaleb, B., Fallon, S., Ross, S.W. and Risk, M. 2011. Reproducibility of trace element profiles in a specimen of the deep-water bamboo coral Keratoisis sp. Geochimica et Cosmochimica Acta 75: 5101-5121. 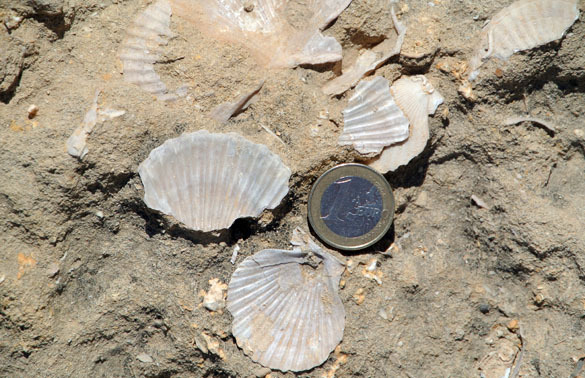 The above fossils were collected from a Lower Pleistocene silty marl exposed near the Megara archaeological site east of Augusta, Sicily, Italy. 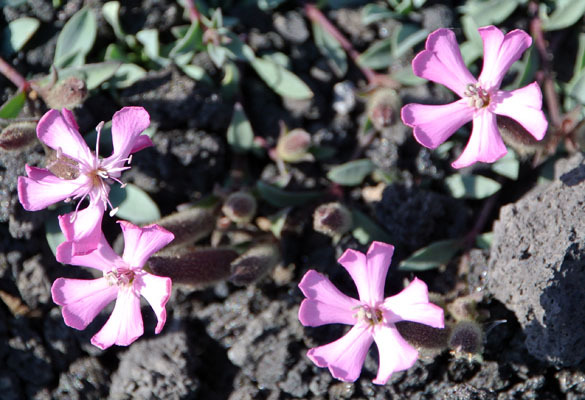 I was on that epic International Bryozoology Association field trip this summer I’ve been blogging about. The shells in this locality are very abundant with hundreds of species represented, from foraminiferans to shark teeth. I thought this little vignette of a predator and its typical prey was worth noting. On the far right is a naticid gastropod (moon snail). These mollusks are predators who kill and consume their prey by drilling holes into their shells with a specialized radula (a kind of tooth-bearing “tongue”). Their holes are distinctively beveled, with a wider portion on the outside narrowing to a smaller inner opening. 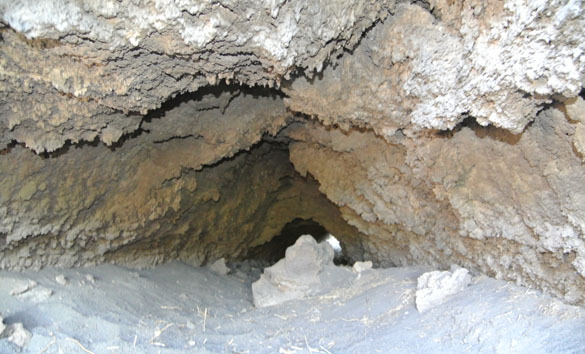 The three organisms on the left all show boreholes indicating that they were likely killed and eaten by a naticid. Or at least that’s the traditional story. A paper came out this year (Gorzelak et al., 2013) comparing predatory drill holes in shells with holes produced by physical abrasion by experimental tumbling. 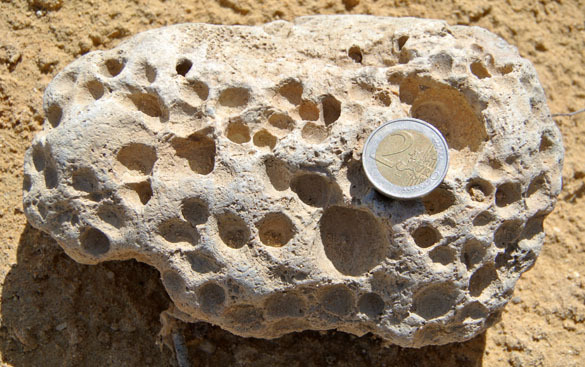 The sizes, shapes and locations of these abrasion-produced holes are shockingly similar to those made by drilling predators. It looks like we must be careful which holes we assign to predation and which were produced by other means. As I look at the three victims above, two of them (the high-spired turritellid gastropod on the far left and the bivalve second from the right) have nicely beveled holes with almost perfectly circular shapes. The gastropod shell that is second from the left, though, presents problems. First, it has two holes that completely penetrate the shell. Predators occasionally bore a shell twice, but not very often. Second the holes are more irregular in shape and don’t have a noticeable beveling. This could be a feature of the thinner shell of this gastropod not recording the usual naticid boring evidence, or it could be the result of physical abrasion and not predation. It is a difficult call but an important one to those plotting the evolution of this predator/prey system through time. Kelley, P.H. and Hansen, T.A. 2006. Comparisons of class- and lower taxon-level patterns in naticid gastropod predation, Cretaceous to Pleistocene of the US Coastal Plain. Palaeogeography, Palaeoclimatology, Palaeoecology 236: 302–320. Kowalewski, M., Dulai, A. and Fürsich, F.T. 1998. 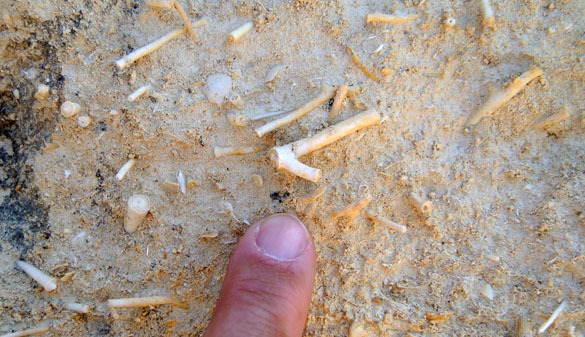 A fossil record full of holes: The Phanerozoic history of drilling predation. Geology 26: 1091–1094. Tyler, C.L. 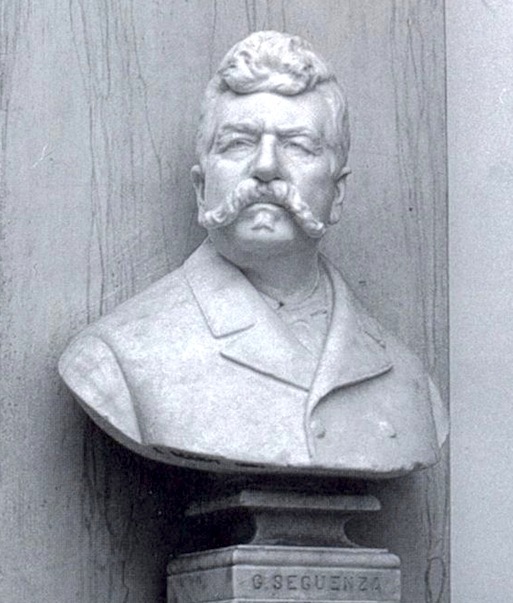 and Schiffbauer, J.D. 2012. The fidelity of microstructural drilling predation traces to gastropod radula morphology: paleoecological applications. Palaios 27: 658–666. 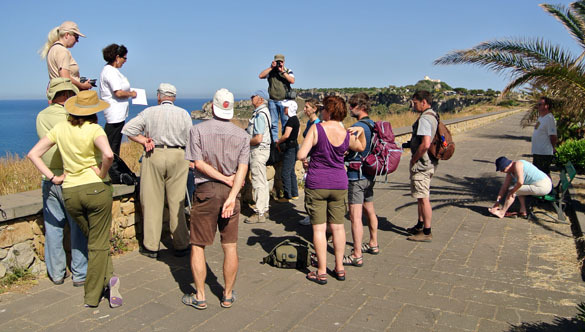 On a recent field trip to Sicily, our paleontological party visited outcrops at Cala Sant’Antonino on the western side of the Milazzo Peninsula in the northwestern part of the island. 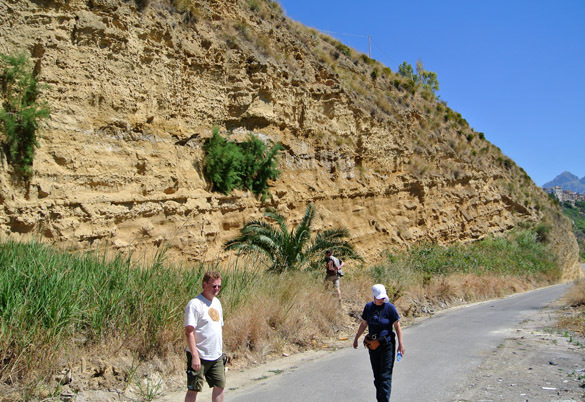 We saw there an Early Pleistocene sedimentary unit informally called the “Yellow Calcareous Marls”. With a handlens you would see a close view of the rock like the image above. 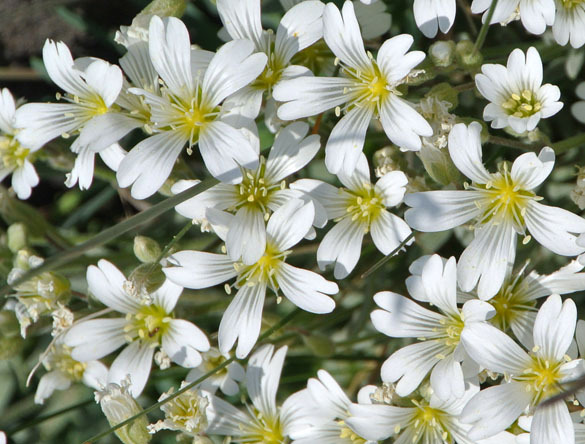 It consists almost entirely of tiny hollow white spheres with occasional dark flecks. In the lab back home these little calcitic balls were revealed to be tests (skeletons) of foraminiferans known as Globorotalia inflata (d’Orbigny, 1839). 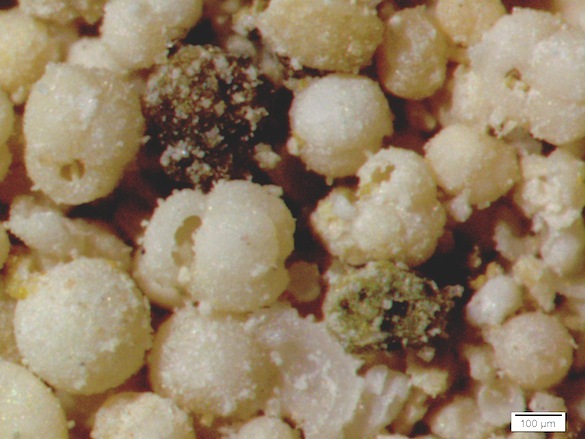 This is a classic example of a biogenic sediment called foraminiferal ooze, samples of which are now in Wooster’s paleontological and sedimentological teaching collections. 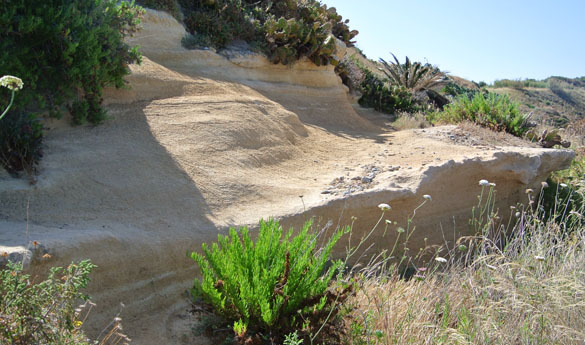 This is the outcrop of the “Yellow Calcareous Marls” at Cala Sant’Antonino from which the above samples were collected. The rock is very soft and powdery to the touch. 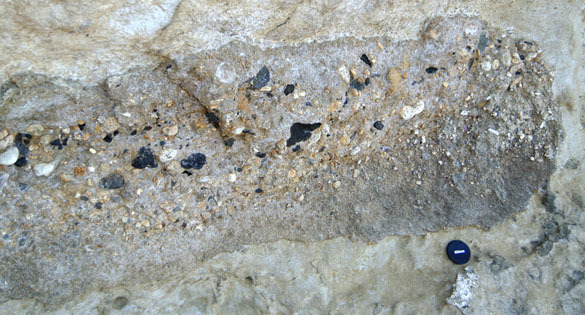 In this closer view of the rock the individual foraminiferal tests are more apparent. Near the center is one example showing the connected bulbous chambers (making it multilocular) and the slit-like aperture between them. These tests are slightly recrystallized, giving them a sugary look. 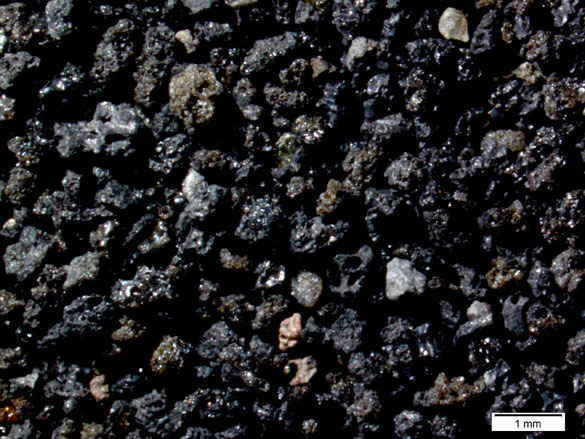 The dark bits are sand-sized volcaniclastic grains derived from early eruptions of the Mount Etna complex. These are modern examples of Globorotalia inflata. (The scale bars are 0.1 mm.) The bumpy surface texture, bulbous chambers and distinctive aperture make identification of the fossil examples fairly easy. The images were taken by Bruce Hayward. Globorotalia inflata is a long-lived planktonic species, meaning it floats about near the top of the water column throughout the oceans. In life these single-celled organisms extend thin strands of material (pseudopodia) into the water around them to collect organic material and the occasional diatom or radiolarian for nutrition. 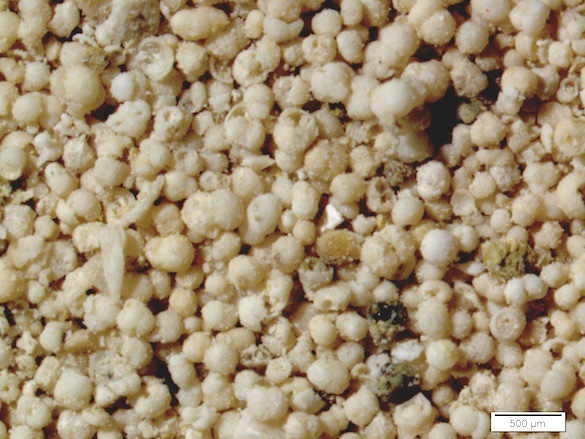 They live in populations with billions of individuals, so under the right conditions their tests can accumulate on the seafloor in numbers so vast they form thick deposits, our foraminiferal oozes. 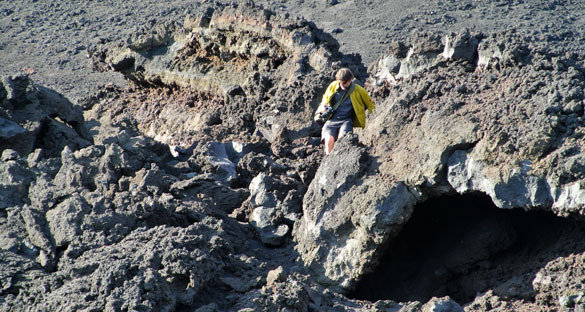 Our particular ooze in this story formed in relatively deep (epibathyal), cool waters during one of the early glacial intervals. This foraminiferan turns out to be a critical guide to the age of the unit as well as its paleoenvironmental context. Fois, E. 1990. 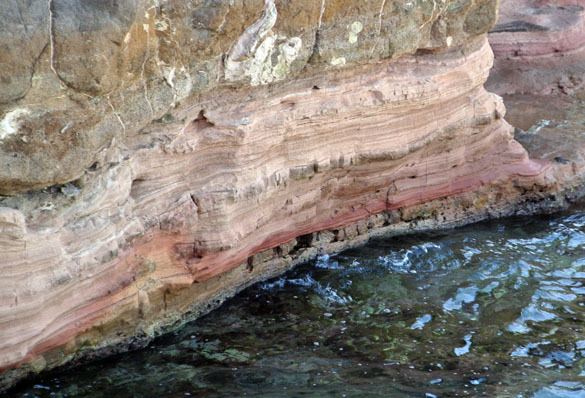 Stratigraphy and palaeogeography of the Capo Milazzo area (NE Sicily, Italy): clues to the evolution of the southern margin of the Tyrrhenian Basin during the Neogene. Palaeogeography, Palaeoclimatology, Palaeoecology 78: 87–108. Sciuto, F. 2012. Bythocythere solisdeus n. sp. and Cytheropteron eleonorae n. sp. (Crustacea, Ostracoda) from the Early Pleistocene bathyal sediments of Cape Milazzo (NE, Sicily). Geosciences 2012 2: 147-156. 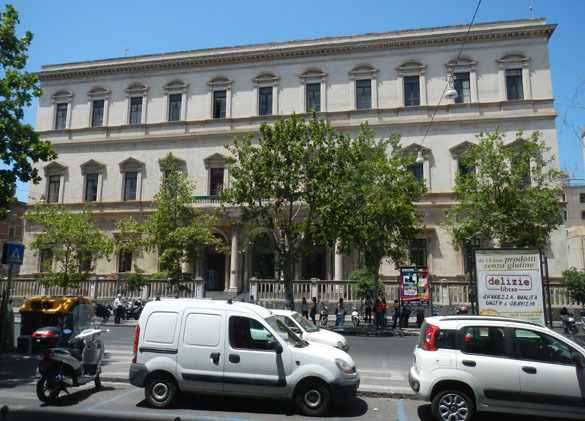 CATANIA, SICILY, ITALY–The IBA meeting has now ended and, as this is posted, I should be winging my way home across the Atlantic. It was a fantastic experience. This is a unique organization, of which I’m now proud to be a member of council. It is a combination of paleontologists and biologists who share a passion for the Phylum Bryozoa in all its manifestations. We had 77 oral presentations and dozens of posters spread among 80 participants, including students, academics, museum scientists, and very keen citizen scientists. The “international” component is taken very seriously: of the 80 people present, 27 countries were represented. 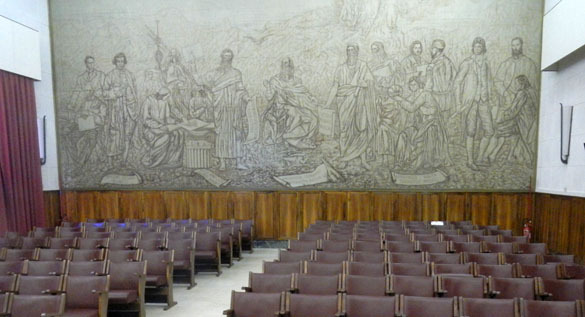 All the sessions were held in the Palazzo delle Scienze building shown at the top of the page. We shared it with the regular student body, so it was a lively place. Directly above is the back wall of our meeting room with images of famous scientists who lived in Italy, from the Greeks to the 20th Century. Italians leave no ceiling unpainted. 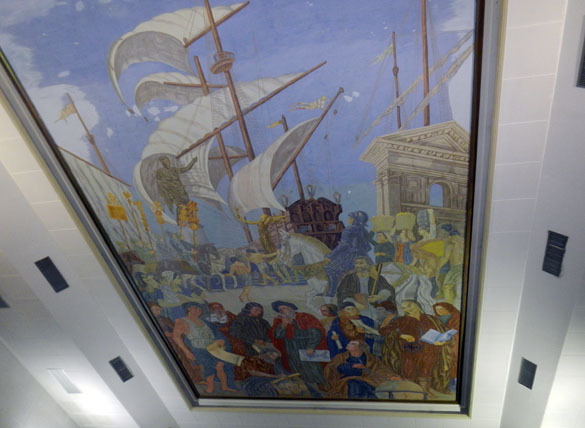 I’m not sure who the people are depicted above us, except that Amerigo Vespucci must be the one holding a map of the Americas. This room certainly makes you feel part of the international scientific enterprise. Here is one of our participants, Kevin Tilbrook, giving a presentation. All our communications were in English. Imagine the challenge of talking in your second or third language with someone else doing the same thing. I am continually amazed by the language skills here. My talk was on Friday morning, June 14. My first slide is shown above. 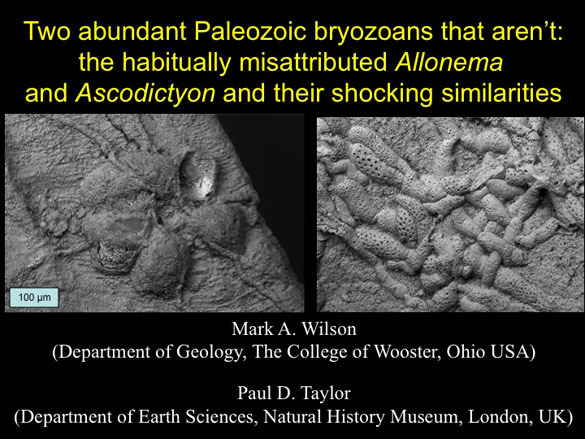 My friend Paul Taylor and I examined two purported bryozoans common in the Paleozoic and showed that they were certainly not members of that phylum, despite some superficial resemblances. 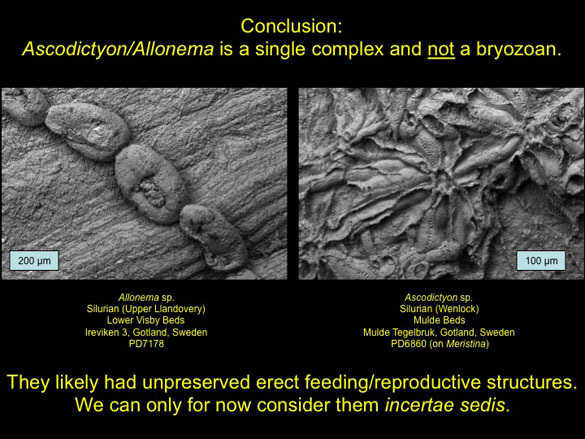 This is our conclusion slide. As you can see, it is relatively easy to say what something is not, but quite another to say what it is! The IBA conference dinner is always a big event. This one was among the most spectacular. 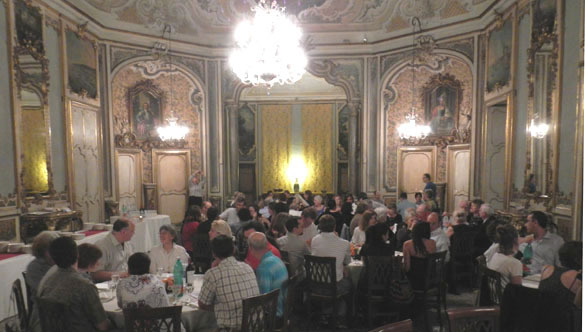 We had dinner in the historical Palazzo Biscari. This is a view from the terrace towards the central Duomo complex. The ballroom is a Baroque fantasy. To complete the image, dinner was preceded by a choral performance from a Sicilian choir tucked back in the alcove. They sang many, many pieces, including some national favorites from countries represented among us. And here is the group photo. Like many, I wasn’t ready for this shot, so I’ll be impressed if anyone can find me in here! 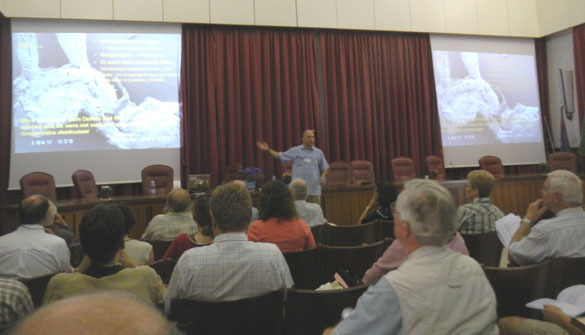 Our meeting was a spectacular success in terms of the science shared and learned, and the Sicilian cultural experiences. Thank you very much to organizers Antonietta Rosso and Rossana Sanfilippo from the University of Catania! 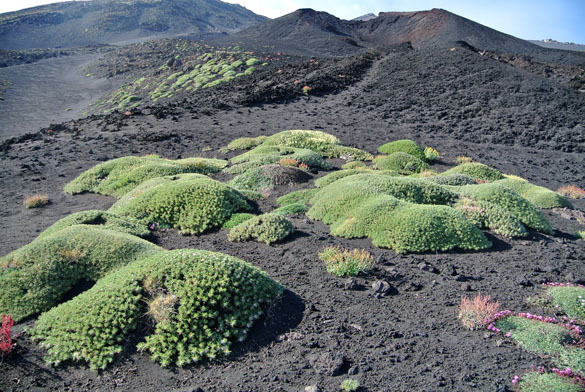 CATANIA, SICILY, ITALY–One of the treats of many small scientific meetings, like the International Bryozoology Association conference I am attending now, is that we can have a variety of short field trips for all participants. 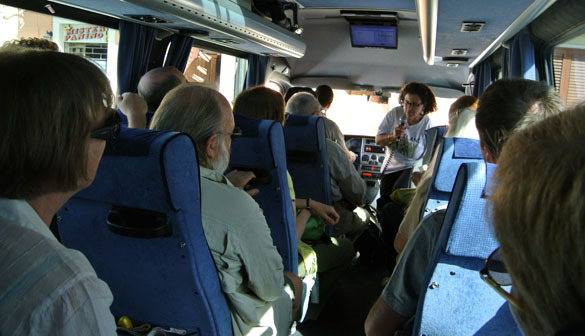 Today we packed into two buses and spent the afternoon and evening in the city of Syracuse south of Catania. Syracuse was founded by Greek colonists (primarily Corinthians) over 2700 years ago. It was the home of Archimedes. He was famously killed there by a Roman soldier when the city was captured in 212 BCE. 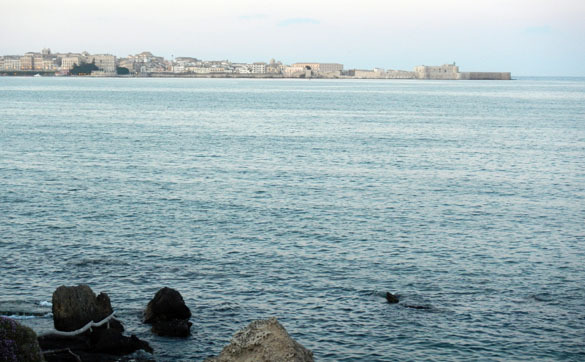 Cicero called Syracuse “the greatest Greek city and the most beautiful of them all”. The Syracusan tyrant Hiero I (who ruled from 478 to 466 BCE) built the outdoor theater shown at the top of this page. (Don’t call it an “amphitheater”!) Just above is a view of the ancient entrance to the theater above the seats. Greek engineers diverted a stream here to fill fountains and pools and eventually flow down to the front of the theater for refreshment and sometimes to be part of the performances. The theater is still used, so wooden seats have been fixed over much of the ancient stone. Behind the theater is this large ancient limestone quarry. You can make out a couple of pillars left in place on the quarry floor, along with characteristic vertical walls and square corners. The sturdy rock here was used to build the city and its walls. 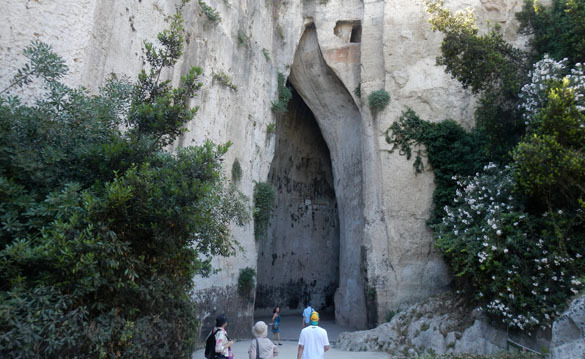 On one side of the quarry is this unusual cave called The Ear of Dionysius. It is 23 meters high and goes back about 65 meters. 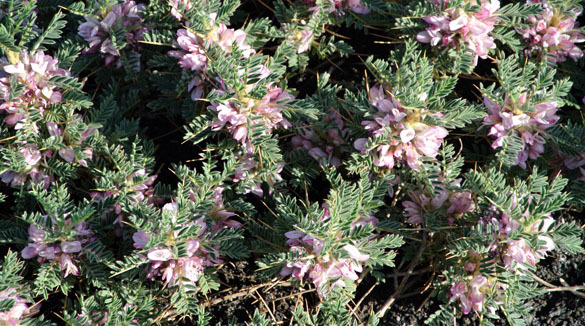 It has an uncanny resemblance to a human ear, hence at least one possible reason for the name. Inside it has smooth walls and a serpentine curve much like a meandering stream. The acoustics are unusual. Apparently even whispers inside can be heard at certain points above the cave’s entrance. The tyrant Dionysius is said to have placed his prisoners in there so that he could listen to their secrets (or to their tortured screams). There is considerable debate (which was repeated in our group) about whether this was all carved by quarriers or is a natural water-eroded slot canyon then modified for human use. 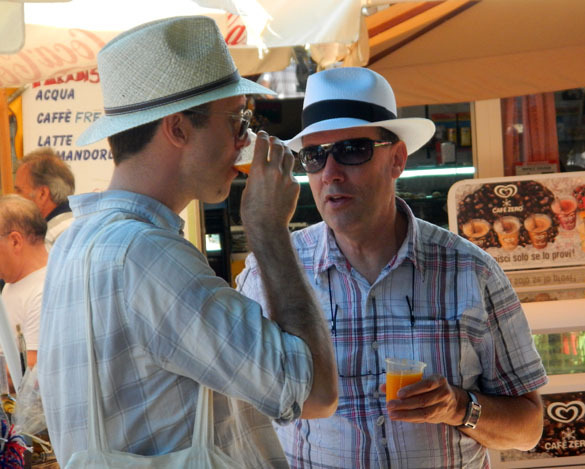 Carl Simpson and Paul Taylor showing stylish Italian straw hats on our trip. At dinner this evening we had this wonderful view of the ancient harbor of Syracuse as the sun set and moon appeared above. Across the water on the end of the promontory is the Castello Maniace, which was originally completed as a fortification in 1240. King Ferdinand III gave this structure to none other than Admiral Horatio Nelson in 1799 for services rendered to the Kingdom of Naples. 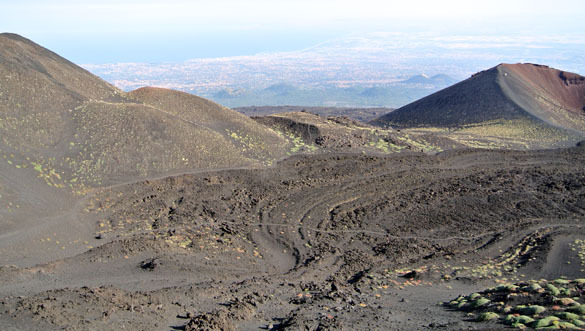 It stayed in private English hands until 1982 when it was given to the province of Catania. I would describe the dinner, but you probably wouldn’t believe how many various Sicilian treats we had, including the inevitable octopus. It was a memorable evening in the middle of our intense conference. 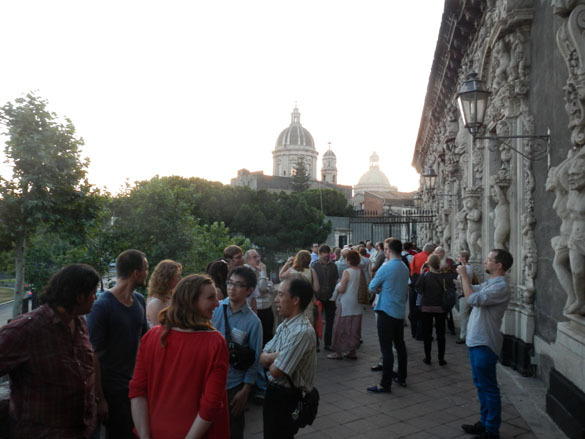 CATANIA, SICILY, ITALY–This was the last day of our International Bryozoology Association pre-conference field trip through Sicily. 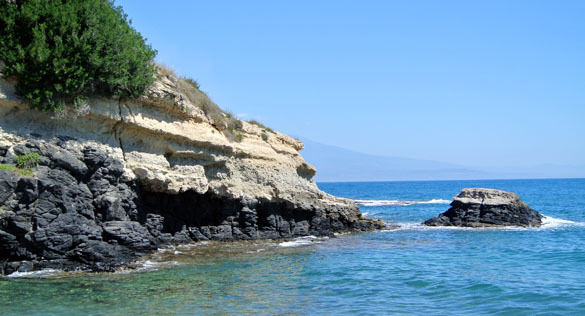 We had an excellent time and covered an extraordinary amount of territory on this large Mediterranean island. We started our final day on the Capo Milazzo Peninsula in the northeastern portion of Sicily. The view above is looking north from the base of the with the main lighthouse on the right and bay on the left. Just peeking around the headland in the distance is one of the Aeolian Islands. We climbed down to study the rocks in the middle distance. One of the most striking units we saw was this Pliocene conglomerate at the base of a small paleobasin cut into a Paleozoic metamorphic complex. 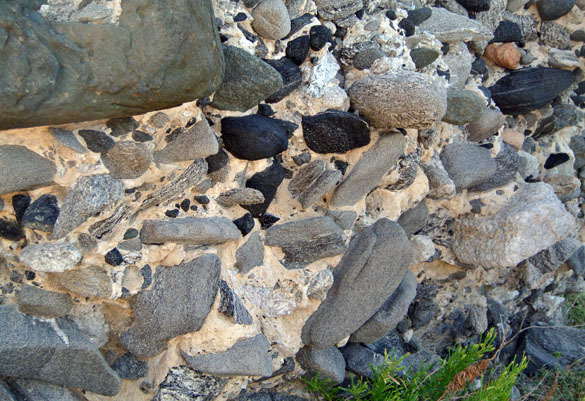 The clasts are a variety of metamorphic rocks, from high-grade schists and gneisses to low-grade greenstones. Eckart Hakansson for scale. This is a closer view of the conglomerates. 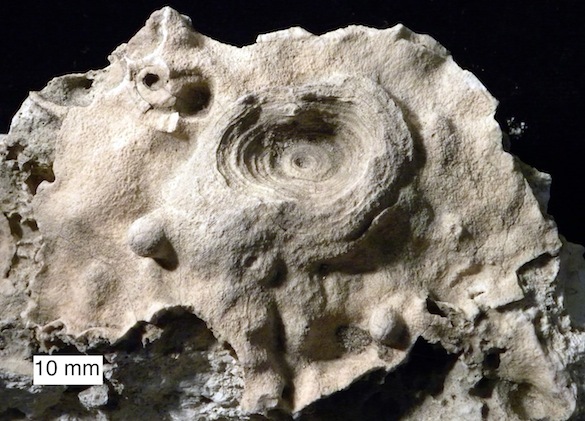 The matrix is a foraminiferan-rich marl almost identical to the marl which lies above it (see the next image). This Pleistocene (Gelasian) marl above the conglomerates is almost 95% planktonic foraminiferans, or at least it looks that way with a handlens. There are some other fossils (see below) and a few sand-sized lithic fragments, but otherwise this is a foraminiferan ooze deposit. 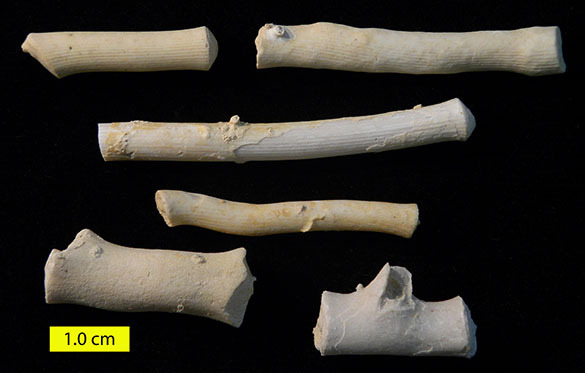 Besides the foraminiferans, the most common fossils in the Pliocene marls on the Capo Milazzo Peninsula are these stick-like objects. They are gorgonian octocoral internodes, probably from the species Keratoisis melitensis. I grabbed a handful and thereby tripled Wooster’s collection of fossil octocorals. 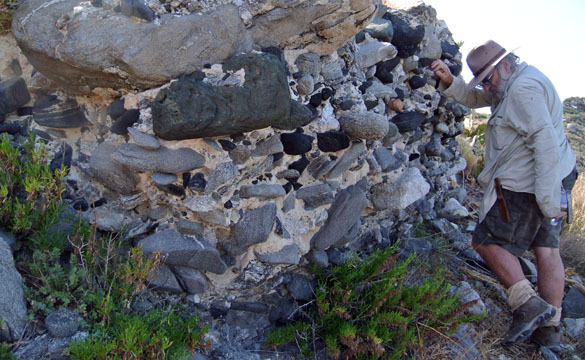 Included in the marls are these cobbles and boulders of Miocene limestones slumped in from the slopes above. They often have large borings from lithophagid bivalves (producing Gastrochaenolites) and a smaller background boring by clionaid sponges (making Entobia). There are spectacular views from Capo Milazzo. 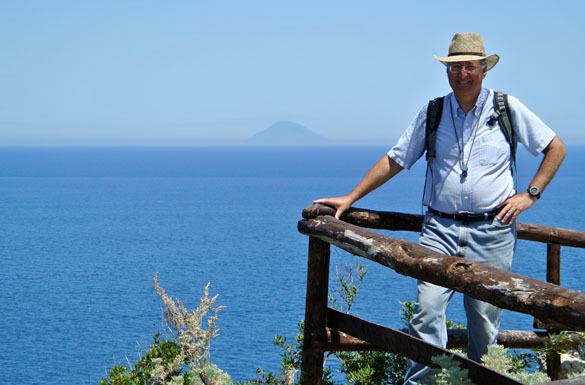 This is looking north at the volcanic island of Stromboli. We spent a long time staring at it because every half-hour or so it spouts steam and smoke for a few seconds. I didn’t get to see an event, but there was a continual very light plume blowing from the right to the left. 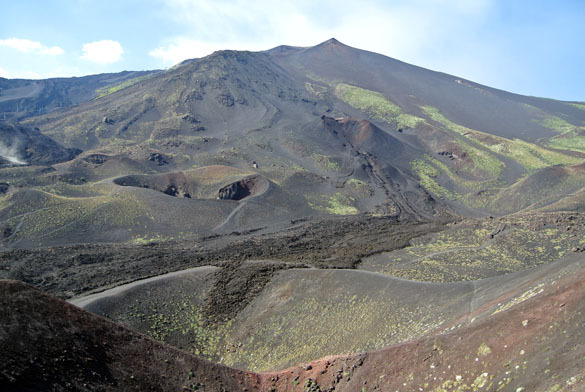 As we were leaving the peninsula, Mount Etna to the south let out a large puff of steam and gases into the murky air. Finally, a few shots from today to show a bit how our field trip worked. 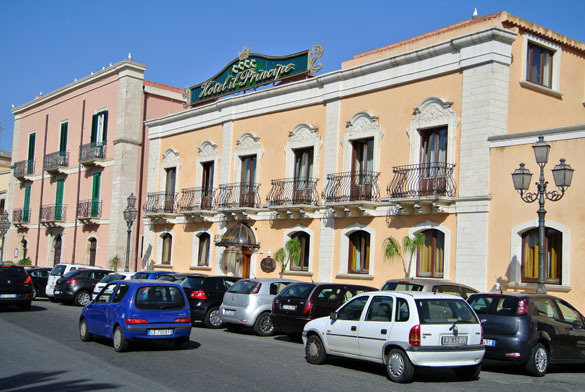 Above is our hotel in Milazzo, typical of the places we stayed around Sicily. Note all the little Fiat cars. In every city and town these cars were constantly buzzing by. This is a view from my seat in our bus. Our intrepid leader Antonietta Rosso from the University of Catania is speaking in the microphone. We are very grateful to her for her planning, energy and good humor. My legs here, by the way, are extending well into the aisle because they just did not fit in these tiny Italian seats. Antonietta Rosso is here giving us a field lecture before we descend down to the Capo Milazzo outcrops. The man taking photographs in the background is a keen Italian amateur who was very helpful. I wish I caught his name. He said one lifetime isn’t enough to enjoy all the wonders of this planet — and then there’s space! Just before lunch we had the requisite castle visit, this one in Milazzo. 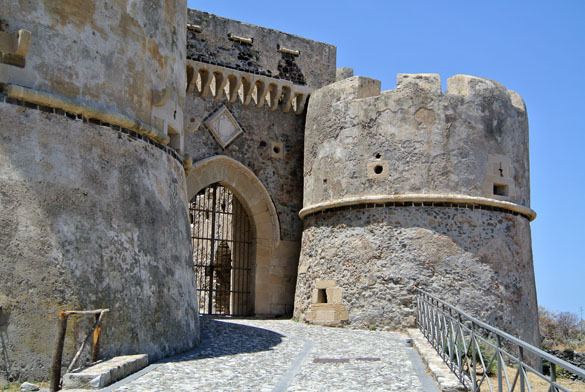 The Milazzo Castle suffered some bombing damage in World War II. The Germans and Italians used Milazzo and its port as a supply center for the Afrika Korps, and then later as a communications center for their resistance to the Allied invasion in 1943. The walls we are looking at here were built by the Spanish (Aragonese) in the 15th Century. 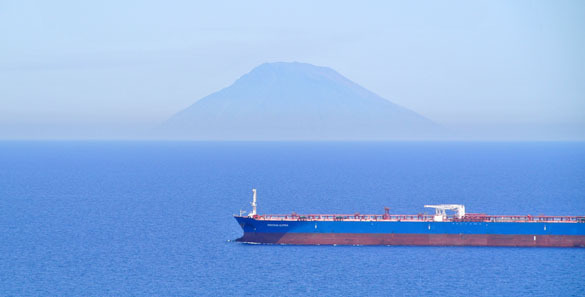 Finally we passed by the Strait of Messina, with mainland Italy visible through the haze. 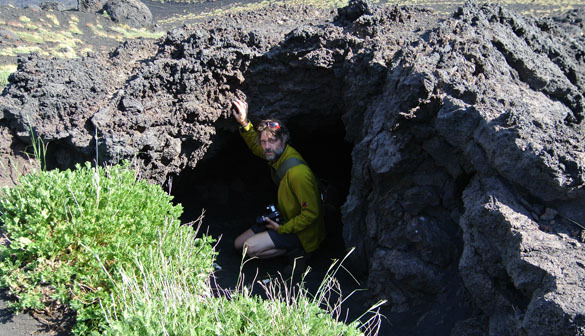 This narrow body of water is extraordinarily deep and its sides continue to be uplifted by tectonic activity. These waters have wicked currents and have been known as a navigational hazard since antiquity. When we saw this strait we knew we had rounded the corner of Sicily and nearly completed our journey around the entire island. Thank you again to our University of Catania leaders, especially Antonietta Rosso and Rossana Sanfilippo. Now we have a few hours to rest before the official International Bryozoology Association Conference begins tomorrow morning. Our last stop of the day on the IBA field trip was to a classic fossil locality on the north coast of Sicily about an hour east of Palermo. 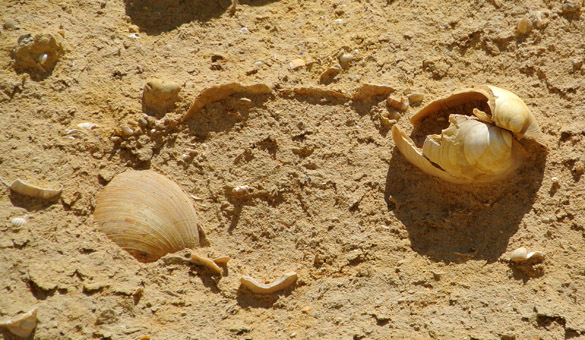 These are fine sandstones and marls preserving a diverse array of mollusks from the Pliocene, including the bivalves shown below. 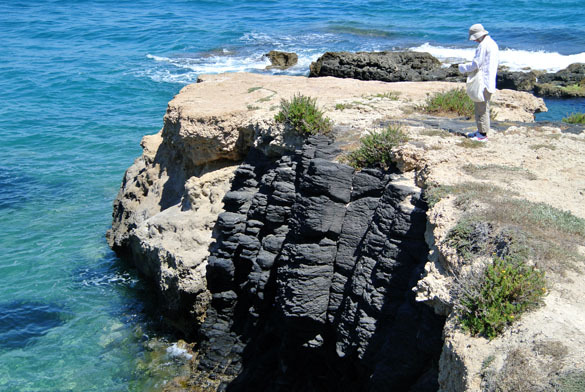 Over 130 bryozoan species have been recorded from this site since 1921. The most interesting features to me were the numerous sclerobionts, including shallow worm and barnacle borings and encrusting bryozoans and barnacles. From here it was a long drive to the beautiful and ancient city of Milazzo to prepare for our last day of the field trip.